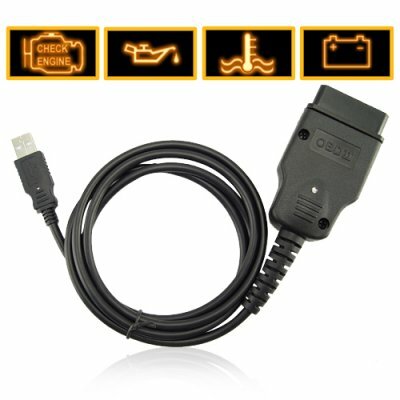 Successfully Added Car Diagnostics USB OBDII 409 Interface VAG-COM Cable to your Shopping Cart. Diagnostic 409 fault code cable for ISO9141 and KWP2000 transmission protocols with 16pin OBDII style data link connector. Perform amazing real-time diagnostics for your car. How? Just use your laptop computer, this USB enabled VAG interface cable, and your favorite diagnostics software, then you can instantly view problems, modify settings and clear errors in your vehicles. The USB enabled VAG serial port connector also assists in supporting the most challenging and time critical applications, like serial EEPROM programming and ECU Tuning. This USB enabled VAG-COM cable will save you time and money in enabling you to diagnose your own car within minutes. Even better, this vehicle diagnostics USB To 16 pin DLC (Data Link Connector) cable works great with versions 3 & 4 of famous VAG software such as ShadeTree Software's ProDiag (for Palm OS and PDAs). This means you can also use this model with compatible Palm and PDA's, thereby allowing you to turn an old PDA into your own personal handheld diagnostic tool you keep in your garage. Car diagnostics USB To VAG fault code cable. NOTE: The CVFG-A11 USB OBDII 409 Interface VAG-COM Car Diagnostics Cable works on the vehicle types as listed above. If you are not sure if this cable will be compatible with your car model, then check the car user manual, contact your car dealer or talk to your favorite mechanic. Can I use this cable with the software called __________that my friend recommended? Can I use this CVFG-A11 car diagnostics USB to VAG-COM KKL cable on my Audi TDI? Yes, and on most VW Audi. Just the ignition. For some tests you might need the engine to be running.